WordPress theme frameworks are themes that allow you to change around and restyle the elements of your theme through an options page. They essentially allow you to customize your theme without having to use the code editor. But these days a real framework is a theme that has connectivity to social media like Twitter and Facebook, is built for child themes and supports microformats. If there’s one thing that WordPress is truly renowned for, it is infinite extensibility. Now the same is starting to become true for some of its’ themes. WordPress established itself a long time ago as ‘the only blog script you need, then it became the only CMS you need. With all the extensibility these themes are offering, one of them may turn out to be the only theme you ever need as well. Hybrid from Justin Tadlock at ThemeHybrid is one of my favorite theme frameworks. It has 14 custom templates for any type of page you might including no-widget pages, login pages, member pages and more. A custom home page template included as a default to the theme’s default index template offers a cool featured post widget that automatically creates a jquery image gallery from the featured post category. Another great theme by Justin Tadlock is the Structure theme, which I am using at Needless Productions (link below and above). Unfortunately this theme is no longer available because ThemeHybrid went exclusively open source and Structure was not licensed under the GNU license. The cleverly named Buffet framework allows users to take and leave what they want from the design of the site. Though the preview doesn’t look like anything spectacular, the admin options and design of this theme offer a huge amount of options for how you display things. Buffet is built with child theme development in mind. Although I haven’t gotten a chance to get in a toy with it much yet, the base CSS used is really quite nice. That alone might get me interested in building something off of it. Coupled with the customisable framework its’ really win win for both designers and users. 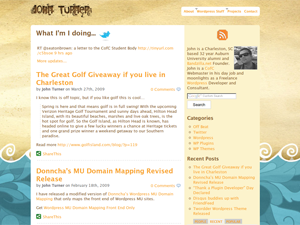 I should have mentioned this Twitter inspired theme in wednesday’s post about WP clone themes If you’re looking for to WordPress theme with features like custom colours, custom background images,custom logo, interchangable layouts and even customisable sidebar width you will be delighted to try out this free theme. The demo again doesn’t look like much but that is because you are able to trick it out any way you like. 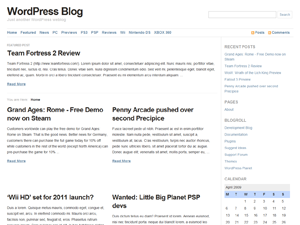 This theme also has some handy features like threaded comments, gravatar support, microformats and Facebook connect support. These, of course, are just a few of the highly customisable frameworks you can find around the web. WordPress.org is a great place to find new and exciting themes that make redesigning a snap, but they aren’t the only game in town. You can find free themes from a number of sources by doing a Google search. This allows you to find other theme directories and people who have just released a theme or two and haven’t promoted it yet. My personal favorite framework themes that I use on my blogs are Structure and Hydbrid, both coincidentally from the same designer. What is your favorite customisable WordPress theme or frameworks have you tried? Are you currently using one of these or a similar theme?